Creativity Bites Back! 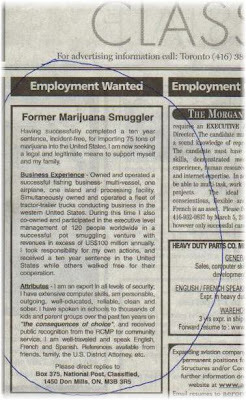 : What a GREAT resume! I think that I'd prefer him to run the banking system rather than the crooks and clowns that have been doing it! Wait a second, the Obama administration's dragging its feet on cabinet and sub-cabinet appointments when there's an individual of such clear qualification available? My God, this guy's certainly got more credibility than Tom Daschle, and at least he hasn't structured his entire life around picking the taxpayers' pockets. I say give him the Department of Commerce, on the condition that 15% of his paycheck goes to reimbursement for the expenses of his incarceration. I agree this guy sounds like he would be better at running the banks than the Bozos who ran them (& the economy) into the ground & then gave themselves huge bonuses & expense paid trips to luxury resorts AFTER they took bail out money. I suspect that all his trucks & legitimate businesses were seized - so he probably paid the cost of his incarceration in advance.